Did I hear wrongly? A bbbbbbb....Banlist? What Banlist? /note: copypasta'd from official VG Facebook page and site. 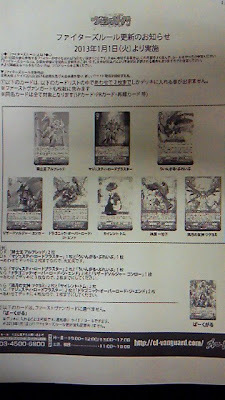 With effect from the 1st of January 2013, for the Japanese version of Cardfight!! Vanguard, the cards highlighted in the following list will be restricted to up to a total of two cards in the deck (including the first vanguard). *This includes all cards of the same name with different rarities. - Total of 2 in a deck, so it’s fine.